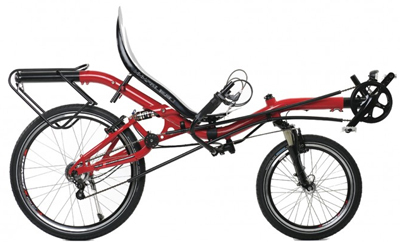 As with any bike, it is easy to add front suspension to a recumbent by replacing the front fork. Lightning Cycles offers a bolt-on rear suspension for they bikes, but otherwise rear suspension must be designed into the frame. 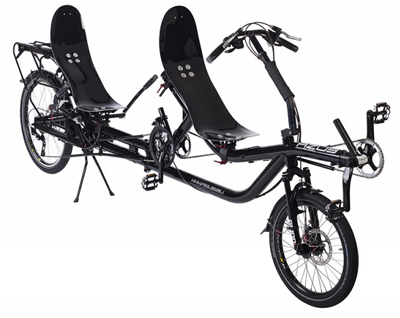 Just putting suspension on a recumbent doesn’t make it “all-terrain.” Most suspended recumbents we’ve seen are aimed at comfort. This is a worthy goal, but it’s got to take a bashing to do off-road touring. Recumbent bikes only work so well as “mountain bikes.” The really technical aspects of all-terrain riding involve shifting your weight between the wheels to climb over obstacles. You can’t do a wheelie on a recumbent because your weight is planted on your seat, not on your feet. Bunny-hops over fallen trees are right out. 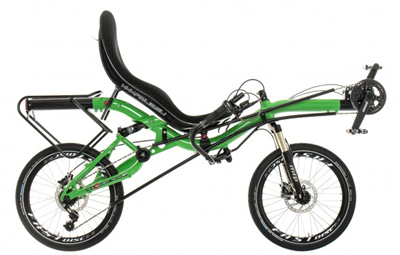 Having said that, there is no reason why you can’t put long-travel suspension systems on a recumbent. Add some wide, knobby tread tires and drive it across an all-terrain swamp somewhere. You’ll still be a lot more comfortable and you’ll get where you want to go. Better, perhaps, to say “off road touring.” Some forms of “mountain biking” tend toward seeking out thrills, diving off cliffs, or racing over impractical terrain. The recumbent biz has a more “laid-back” mindset. A trip into the wilderness, with or without your tent, is the picture we paint. Typical to recumbents, we’re pressed to classify bikes by purpose, such is “road,” “MTB,” “BMX,” etc. Most could be called touring bikes except economy models designed to take less abuse. 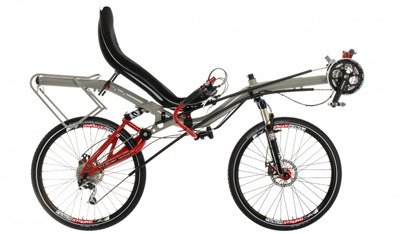 Rigid frames with the right parts shade toward “road bikes.” Suspended frames with the right parts shade toward “off-road.” Other design features lend stability at low speeds over difficult terrain even without suspension.